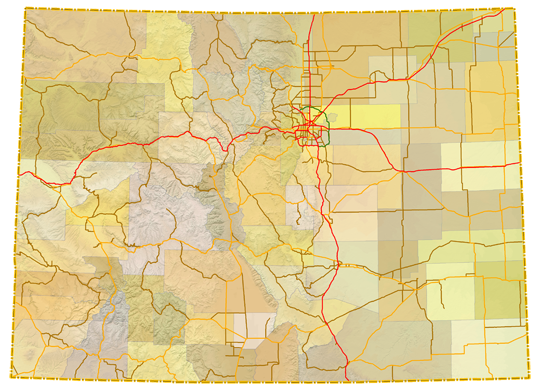 Sitemap to all pages covering the state of Colorado. Many thanks to David Wilson, Joe Lockhart, Kenyon Schuett and Matthew Salek for accompanying us on these roadtrips through the Centennial State. Photography contributions by Alex Nitzman, Andy Field and Brent Ivy. With some exceptions, Colorado Department of Transportation (CDOT) generally does not sign overlaps. Instead shared alignments across the state are inventoried as one route. This results in several disconnected segments of U.S. and State Highways, with implied overlaps using other routes. Such is the case with U.S. 6, where 13 segments make up the overall 467.28 mile route across the state. The route is not posted along Interstate 70, which replaced it throughout the Rocky Mountains. Figures cited throughout the site were obtained from the CDOT Straight Line Diagram Tool.